Thirty-six veterans were recognised for their contributions in the Arctic Convoys at a special medal ceremony held at County Hall, Worcester on Monday, November 24. The ceremony was organised by Worcestershire County Council in conjunction with the Embassy of the Russian Federation. Chair of the county council, Pam Davey gave a welcome address to the Russian guests and war veterans. The Ushakov Medal was awarded to veterans of the Arctic Convoys of World War Two delivering essential supplies to the Soviet Union. Sergey Nalobin, Counsellor of the Russian Embassy presented the medals alongside Third Secretaries Sergey Belyakov and Sergey Fedichkin and Assistant Naval Attache Commander Dmitry Sharapov. 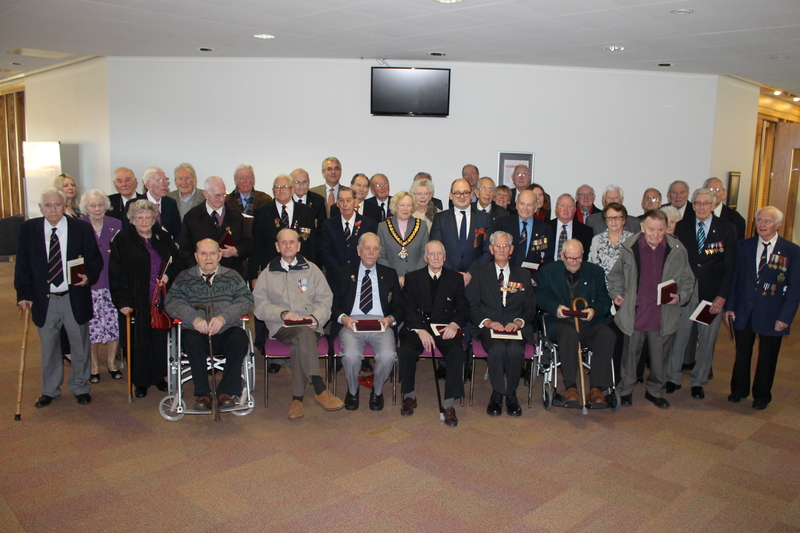 After the ceremony the veterans proudly posed for photos before sharing stories of their experiences in the Arctic Convoy with the Embassy and other invited guests which included representatives from today's Royal Navy, Commander Andy Price and Chief Petty Officer Tony Scripps. One veteran commented that if they hadn’t transported the cargo, Russia might not have existed today. Another veteran said that it was an honour and privilege to receive the recognition and appreciation from the Russian Embassy but was modest when referred to as heroes in Sergey Nalobin's welcome by saying: "We are not the heroes, we were just doing our job." Pam Davey, Chairman of Worcestershire County Council said: "It was a very special day to honour these WW2 veterans and recognise their bravery and commitment. As chair of Worcestershire County Council it was a great privilege for me to welcome these special guests and hear their memories first hand."